D-Tech was one of the first companies to introduce RFID systems into libraries and are constantly developing new and innovative products so customers can deliver new and exciting services cost effectively. 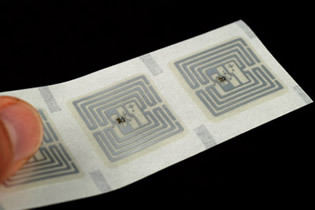 How does RFID benefit librarians? RFID frees up staff time and allows them to interact more with library visitors, develop new services and benefit from faster, smarter transactions. Time and effort is saved through faster, easier issuing, returning and tagging of items. RFID provides improved security systems and flexibility in stock management and inventory control, data collection and trend analysis. How does RFID improve service to library visitors? RFID allows you to deliver services smarter, faster and in the way visitors want to receive them. RFID speeds up processing at the issues desk and self service systems can eliminate queues or long waiting times all together. RFID can also provide the means to offer longer opening hours, enhanced customer services and improved stock availability. The tags on multiple items can be read at one time, then automatically issued from your library management software and security disabled... all without the use of a barcode scanner. 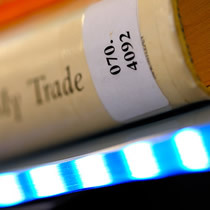 The tags on multiple items can be read at one time, then automatically returned into library stock and the security enabled... all without the use of a barcode scanner. Automatic return shutes and sorting machines allow for an effective 24/7 returns service to customers and a great time saving feature for staff. By not having to open books or scan barcodes saves staff a lot of physical effort over the course of the day. 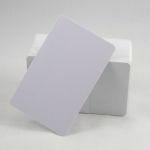 Appling RFID tags to items is much easier and quicker than EM security strips. 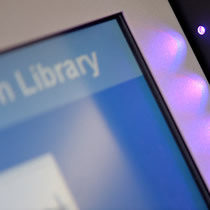 RFID simplifies the self-service process improving convenience and service to library visitors. D-Tech RFID security gates don't give false alarms. D-Tech RFID gates have detection rates of up to 95% making them a greater deterent to costly book loss. 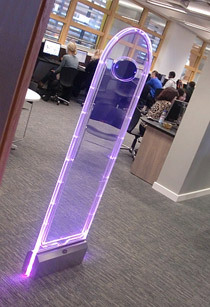 D-Tech RFID gates cover wider entrances with single spans of up to 1.6 metres per aisle. D-Tech Gateviewer software shows what items alarmed the security gates and when, giving a better chance of tracking down missing items. Scan your library with our D-Tech RFID Inventory Wand to find missing items or to perform a stock take in a fraction of the time. The D-Tech RFID StaffPad circulation tool for processing issues & returns at the staff counter.